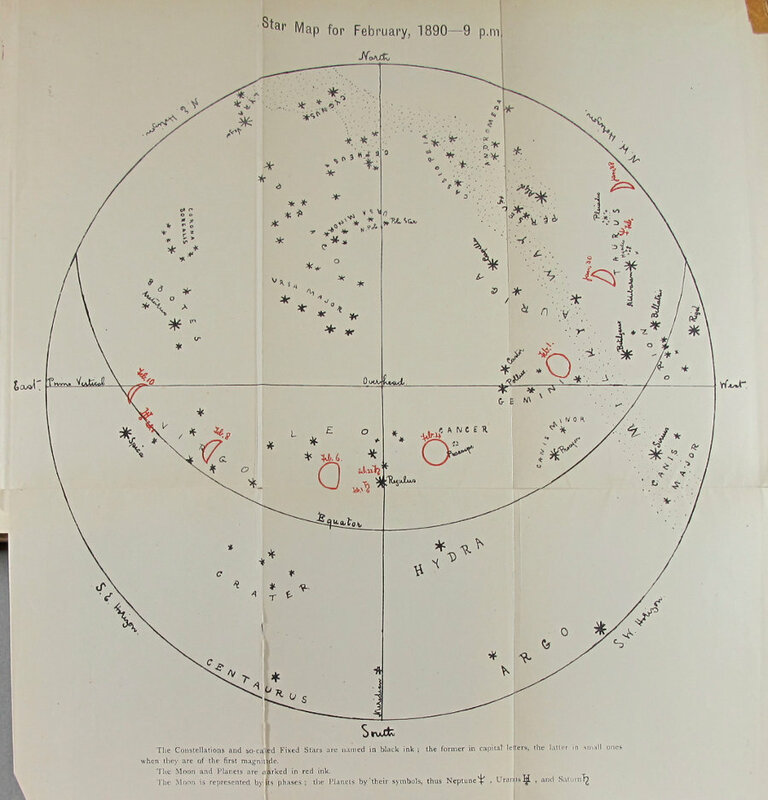 We propose to give a monthly map of the sky, containing the chief stars in the constellations which are above the horizon about 9 p.m., also the planets which are then visible, and the position of the moon at short intervals, so that on a fine night the principal objects in the heavens may be identified. The maps will be accompanied by short descriptions of any phenomena of interest occurring during the month, including eclipses, occultations, &c, if any; also some account of the planets and principal stars visible. We do not undertake to teach astronomy, but hope to afford some little help to parents, so that those who have children with inquiring minds may be able to answer the question, "What star is that?" The Moon is full on the 4th, at the third quarter on the 12th, new on the 18th, and at the first quarter on the 26th. Mercury and Venus are practically invisible; the latter is quite so, but the former might with a little difficulty be made out before sunrise at the end of the month, in the East. Mars is only to be seen before sunrise in the Western sky. Jupiter is visible in the East in the early morning. Saturn is well situated for observation during the whole of this month, being near the meridian. Its remarkable peculiarity can be distinguished in a good opera-glass, by means of which keen eyes can make out its ring. It also has eight satellites in constant attendance. As Saturn is at present North of the Equator we see its South side, and as it will travel further North until April 26th, its ring will widen gradually until then, when it will close again as gradually. When it crosses the Equator, which it will not do during this year, the ring becomes so thin as to be almost invisible. This ring is not of the same density all through--in some parts it is very bright, in others very dark or so dim as to resemble crape; nor does it always present the same appearance in telescopes. It is apparently formed of a number of rings close together, these again being composed of minute stars. Uranus and Neptune are so much further from us, being distant from the Sun 1770 and 2746 millions of miles respectively, that they are not prominent objects in the heavens and are difficult to detect by the naked eye unaccustomed to their appearance. They are, however, both above the horizon at present. Uranus, with its four satellites, is almost due East near Spica, while Neptune, with its one satellite (supposed to be the largest of its class), is to be found in the North-west, in Taurus. In order to find out which part of the map refers to a particular part of the sky, the position of the North Pole must be determined. The two last of the seven bright stars in the Great Bear (familiar to every one) are called the Pointers, because they point to the Polar Star, which lies about half way between the Great Bear and Cassiopeia, a constellation whose brightest stars form an uneven W.
Auriga, a constellation in the North-west, contains the brightest star in the Northern hemisphere, called Capella, which is red in colour and is at an enormous distance from us. Light travels at the rate of 186,000 miles per second, and it has been calculated that the light emitted by Capella has to travel for eleven years before it reaches us. In Gemini, Castor is one of the finest double stars, and first suggested binary systems to Herschel; that is, that there are many pairs of stars the components of which revolve round each other. By recent spectroscopic observations, it has been discovered that Castor is receding from us at the rate of twenty-five miles per second. Procyon, in Canis Minor, is a star of the first magnitude. Cancer can be distinguished by the remarkable cluster of stars called Praesepe, which is just resolvable by the naked eye, and full of fine combinations. Leo, which is on the meridian, is always recognisable by the resemblance of its fore-part to a sickle of fine stars. The bottom star of the handle of the sickle is Regulus, of the first magnitude, and this star occupied the place of the Lion's Heart in the fanciful delineations of the constellations made by the ancients. It has been found by modern research to be travelling away from us at the rate of from twelve to seventeen miles per second.